Anyway, I digress. We have a pond in our backyard and as the weather warms up for summer, frogs appear and their musical croaking lulls me to sleep each night (my brother-in-law visited and couldn't sleep for all the noise, so I guess it's not a lullaby for all). And then I read this gorgeous book, The Garden of Evening Mists by Tan Twan Eng, and it said frogs were mating when they sang all night (except this was said beautifully, not just splatted on the page like I did it!). 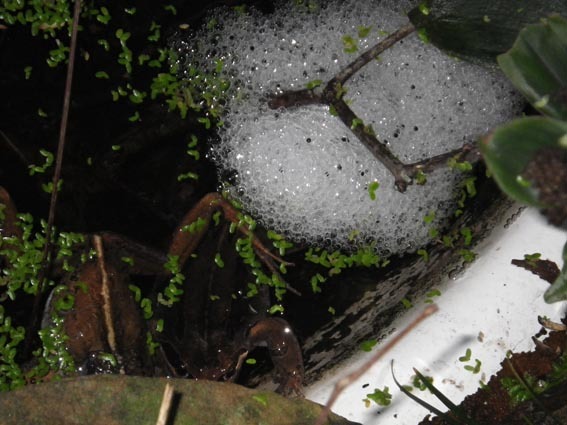 This made a lot of sense because my frogs after a noisy night, leave masses of frog eggs in froth, and I sometimes even catch them still piggybacking.These two are in the side-by-side exhausted stage I think (I hope you can see them in the bottom left, heads obscured by the leaf for privacy of course! ).